On 22nd July David turned the grand old age of 23! Cue many tears and much crying, from him. I'm perfectly happy, because it means for the next 5 months I am only 1 year older than him! It's the simple things in life, right? To celebrate this extra year, we both booked 2 days off work (Wednesday + Thursday. 'Why not Friday too?' I hear you ask. I have no freaking idea! So, so stupid!) 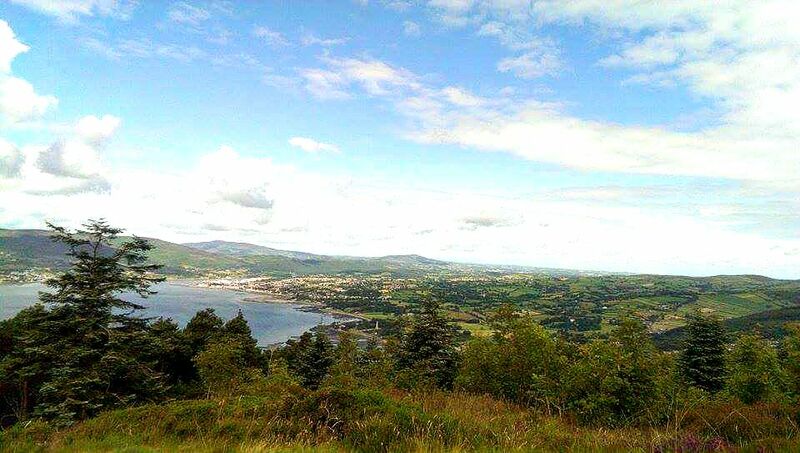 and we went on a roadtrip to Rostrevor, Co. Down, to get a much needed fill of crisp, mountain air and breath-taking views. Cloughmore Stone - Or, more specifically, the views from it. The stone, locally known as The Big Stone, itself is really just a large rock, nothing much more exciting than that! Okay, well the myth and folklore stories behind it are pretty fascinating, but it really is just a big lump of stone, perched on top of a mountain! If you're interested in reading the myth, you can find it here. It's the view from up there that makes this place unbelievable. 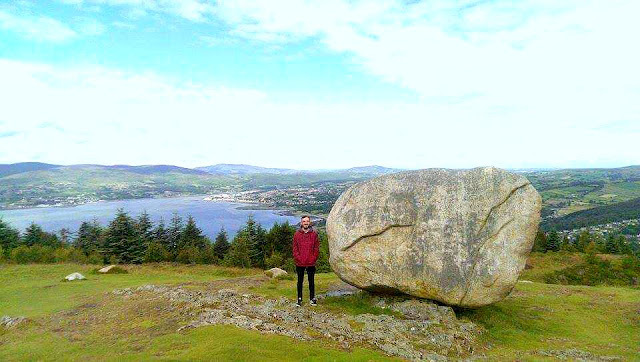 It is so majestically beautiful, I could honestly sit up there all day and just look out over Carlingford Lough, and the villages of Rostrevor & Warrenpoint. It's just glorious! The Narnia Trail - Apparently, Carlingford Lough and the mountains and forests surrounding it were the inspiration for C.S. Lewis Chronicles of Narnia! Standing at The Big Stone and taking in the view, it's really not hard to see why. In honour of C.S Lewis, The Narnia Trail brings to life aspects of the stories. It's quite a short walk in Kilbroney Forest Park, a small loop through a section of the woods, but it is definitely worth a visit. Hidden amongst the trees are sculptures, and artwork taken and interpreted from the world of Narnia! The Giants Trail - We also went to find The Giants Trail, in Slieve Gullion. Yes, yes we are massive children! But it was so much fun! It's a similar idea and layout to the Narnia Trail, but its incredibly more detailed. There were so many fairy doors on trees, and complete fairy houses built and decorated inside! It's a longer walk than the one in Kilbroney, but there is so much more to see. We had a great time wandering around, finding all the little surprises tucked away in the trees! Even if we were literally the only ones there without children! We also went for dinner in a lovely restaurant called Fusion, in Warrenpoint. We were lucky enough to be there for steak night, and oh my goodness...it was so good! I wasn't able to get any good photos in the restaurant, it was pretty dim inside, but just trust me on this one. If you are ever near Warrenpoint, you should head here for dinner. It was so tasty! Have you ever been to any parks like these before? What do you think of them?